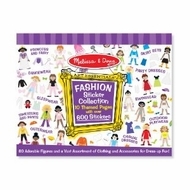 The fashion runway awaits the stylish design sense of your young designer with this collection of over 600 stickers featuring 80 young models and lots of clothing and accessory stickers for every occasion! From swimwear, to party dresses to sleepwear-your fashionista will be ready to set the next fashion trends! Princess and Fairy, Dancewear, Skirt Sets, Party Dresses, Swimwear, Outdoor Play Wear, and more.